Do you know what p-hacking is? John Oliver – of HBO’s “Last Week Tonight” and formerly of “The Daily Show with Jon Stewart” – does. It’s a tricky, potent analytical pitfall that’s gaining increased, deserving attention – across fields of science and even within Predictive Analytics Times articles and Predictive Analytics World sessions. “An orange used car is least likely to be a lemon,” for example. That’s what was claimed by The Seattle Times, The Huffington Post, The New York Times, NPR, and The Wall Street Journal. But this discovery has since been debunked as inconclusive. As data gets bigger, so does a common pitfall in the application of standard stats: Testing many predictors means taking many small risks of being fooled by randomness, adding up to one big risk. John Elder calls this issue vast search. It is also known as many other things, including multiple hypothesis testing, over-search, the look-elsewhere effect, the garden of forking paths, cherry-picking findings, and significance chasing. I was pleased to see this important topic covered by a relatively mainstream outlet. 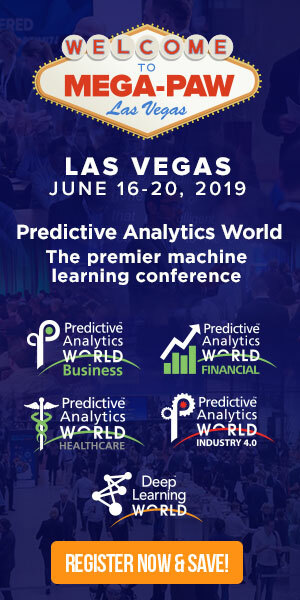 Eric Siegel, Ph.D., founder of the Predictive Analytics World conference series and executive editor of The Predictive Analytics Times, makes the how and why of predictive analytics understandable and captivating. He is the author of the award-winning Predictive Analytics: The Power to Predict Who Will Click, Buy, Lie, or Die, a former Columbia University professor who used to sing to his students, and a renowned speaker, educator, and leader in the field. Eric has appeared on Al Jazeera America, Bloomberg TV and Radio, Business News Network (Canada), Fox News, Israel National Radio, NPR Marketplace, Radio National (Australia), and TheStreet. He and his book have been featured in Businessweek, CBS MoneyWatch, The Financial Times, Forbes, Forrester, Fortune, Harvard Business Review, The Huffington Post, The New York Review of Books, Newsweek, The Seattle Post-Intelligencer, The Wall Street Journal, The Washington Post, and WSJ MarketWatch.